Someone asked me if we were decorating for Christmas a few days ago when I was sitting on a stool in our village pub. I responded with an enthusiastic yes, but acknowledged that the house was a bit of a mess and the tree was unfinished. I went on to say that John had dug up our Christmas tree from the front of the house and moved it inside after putting it in a pot. Even though we’ve known each other for almost four years, this will only be our second Christmas in the house together. 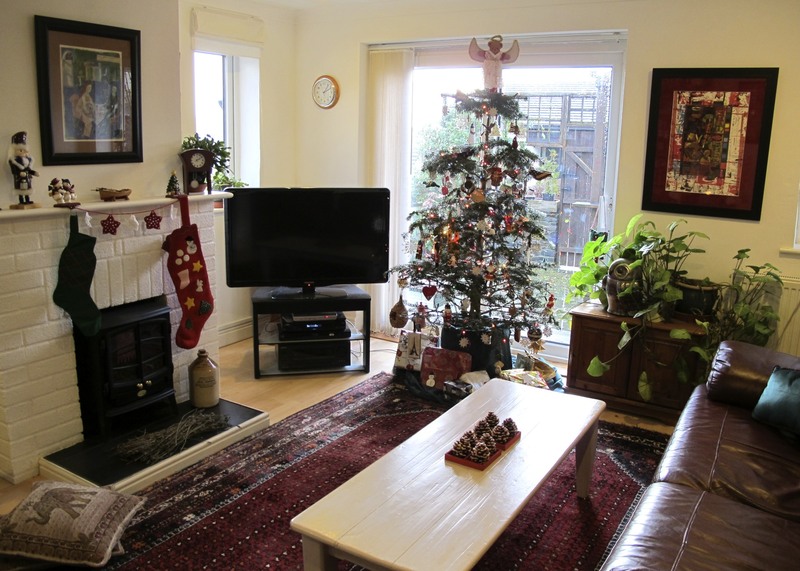 I wrote a couple of posts about our first Christmas and the tree in the posts from then is the same one you see here. I stayed up late last night to put the rest of the ornaments on it so that I could tidy the room and but the box away that holds the Christmas lights and ornaments. Notice how I said, ‘the box’ not boxes? 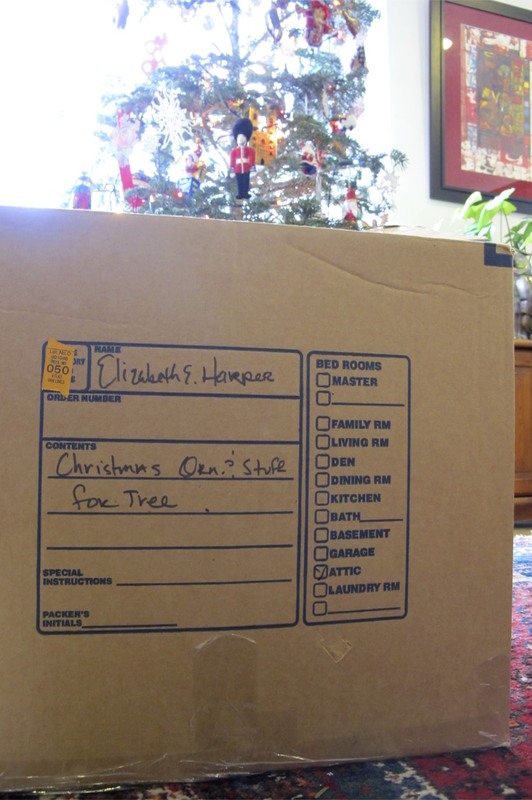 There was a time when I would unpack loads of Christmas decorations for the house and tree, but after moving to the UK, it all fits in one medium-sized box. The effect of having less decorations for the tree and house makes the holiday season more fun and I’m less rushed to get everything out quickly and assembled. This makes it easier to linger over the memories that come up for me when I unwrap the ornaments. 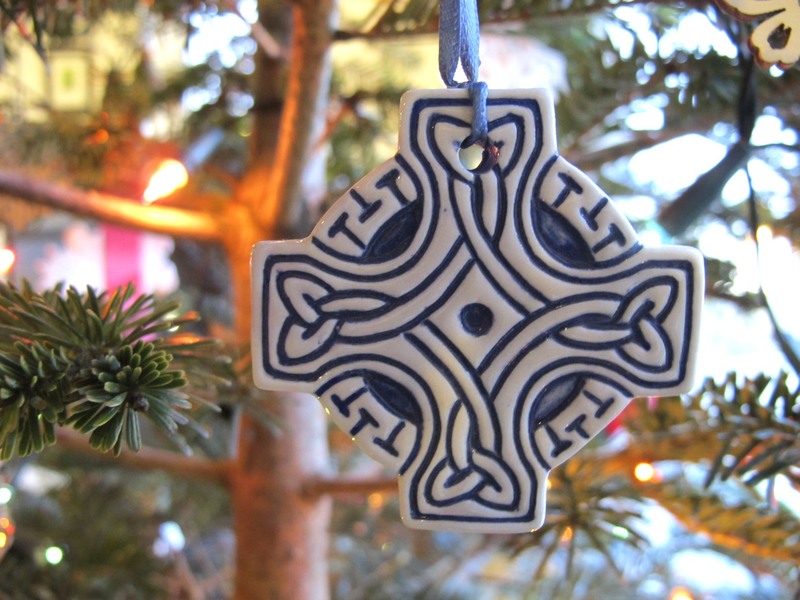 This year, I was impressed by how many ornaments we already have from our travels together. Most of what hangs on the tree came with me when I moved to Cornwall, but since John and I married in 2009, we’ve managed to pick up quite a few more. 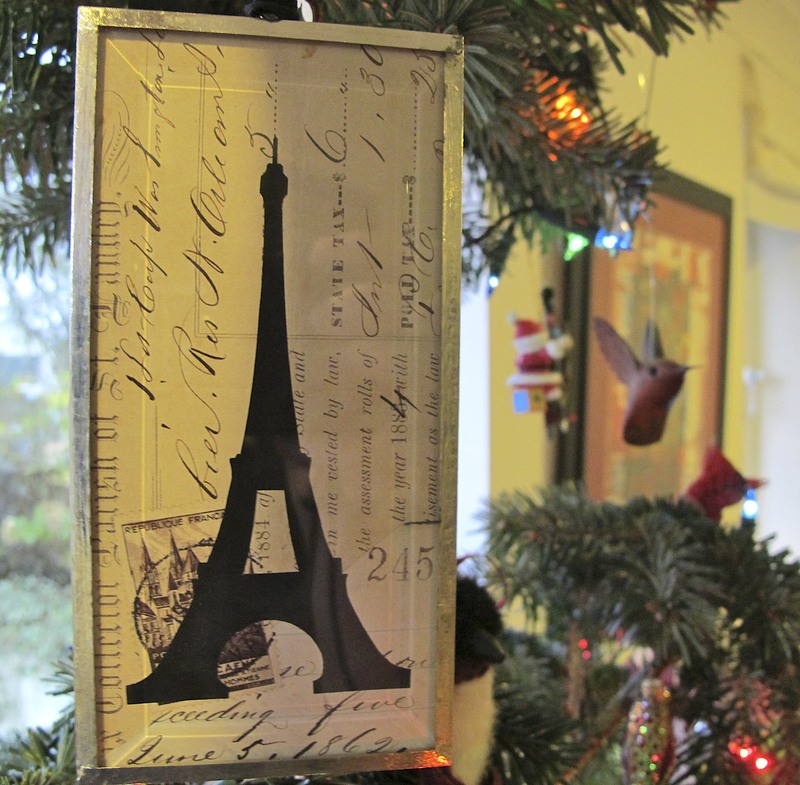 This ornament made from letter written in 1862 reminds me of our honeymoon in Paris. It was a gift from my dear friend David in Atlanta. 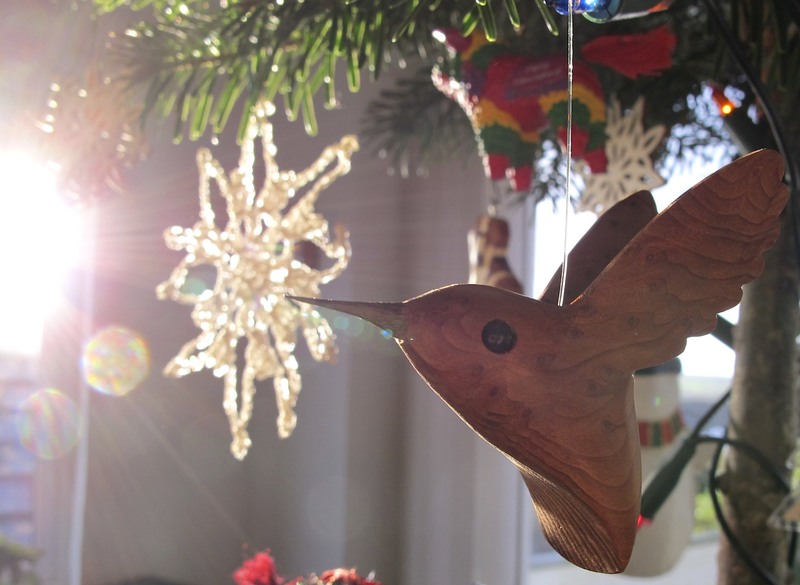 He sent me home with another carefully wrapped wooden hummingbird when I was in Atlanta for the summer and it was one of the first ornaments I put on the tree this year. Here’s the hummingbird along with a crocheted snowflake that my step-mom Cullene gave me from her tree. It’s one of three she gave me that remind me of home. When I put these on the tree I can picture her washing, starching, and ironing the ton of snowflakes that she hangs on her own. The Kiwi came home with us from our New Zealand trip last year. 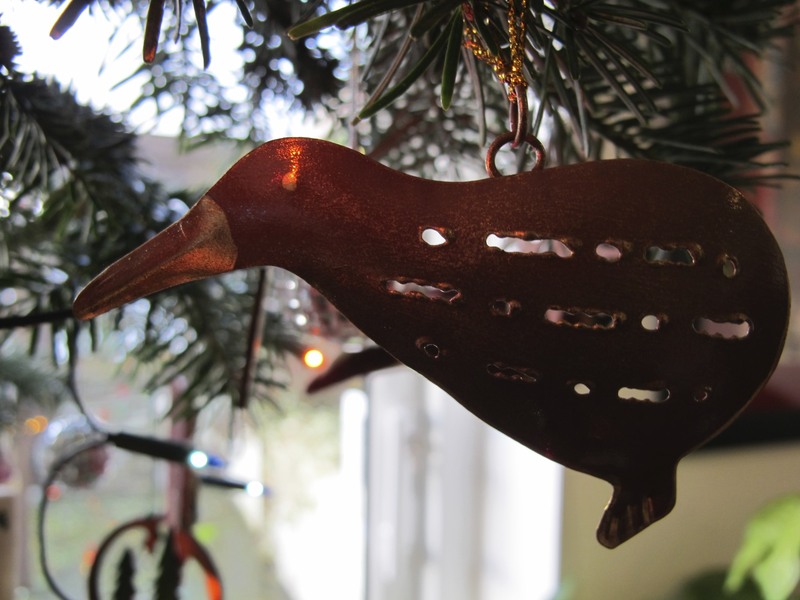 It was difficult to find a Kiwi ornament that was not bejeweled and overdone. 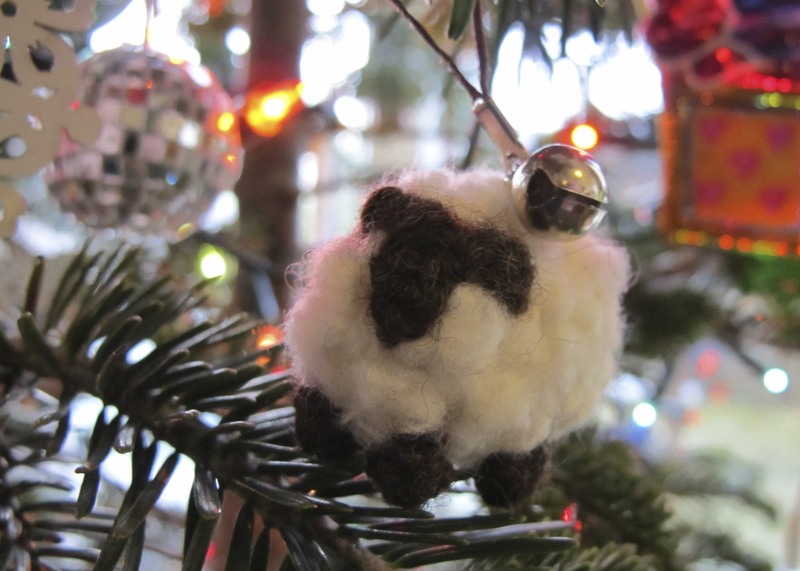 This New Zealand sheep was handmade by a woman in a yarn store in Christchurch and is my favorite of the two we brought back. It’s funny how many ornaments are actually gifts from other people such as this one my sister Margaret gave me of a wreath made from Kansas wheat. 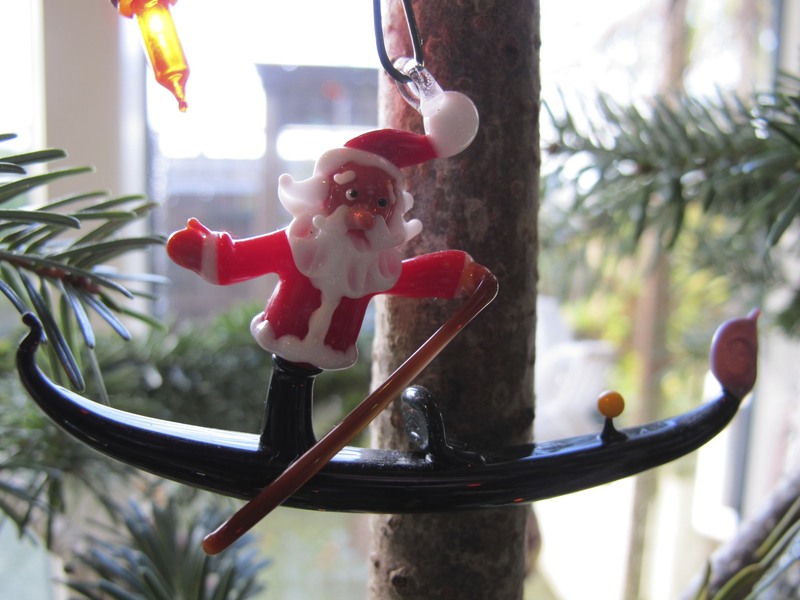 Cullene brought this glass blown ‘ Santa in a Gondola ‘ back from Venice. My own stop in Venice was a quick trip to change trains on my way to Greece in 1981 so I’ve not really been there yet myself. These two are from Scotland, a place I love no matter how rough the weather. I carried thistle in my wedding bouquet when John and I married. 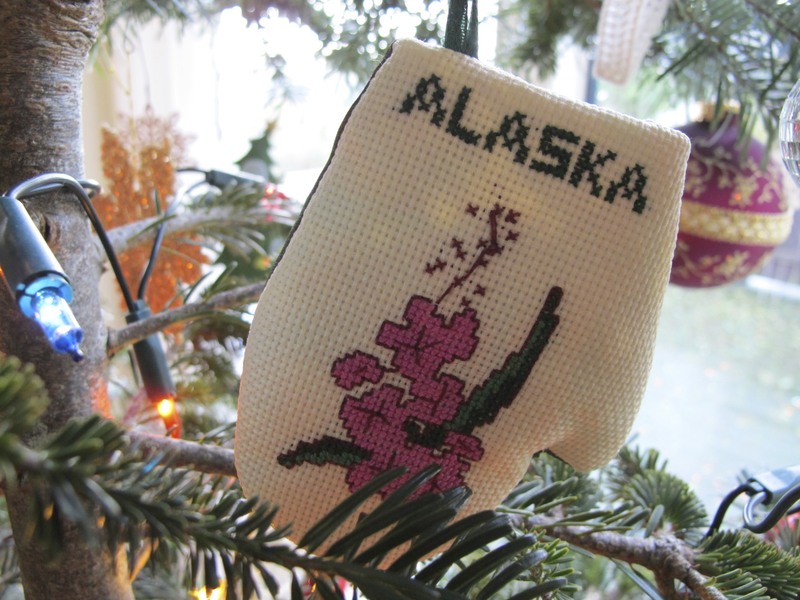 This came from a trip I took with Miranda to Alaska in 1986 to meet my nephew Sam when he was born. I made this from a key chain that I bought when John and I did the Tour du Mont Blanc in 2008. I thought the St Bernard was a good reminder of our long walk through the Alps. These three combine the land of my birth in America with my new home in England. 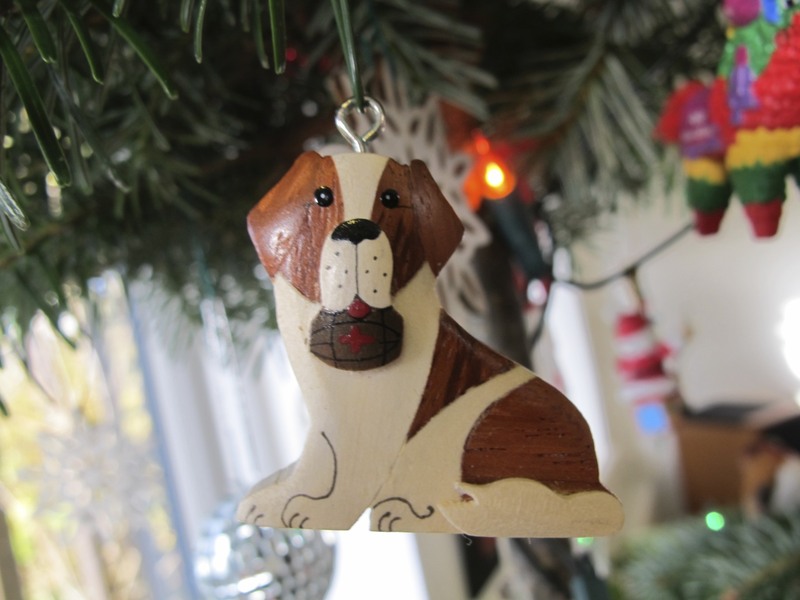 Miranda and I bought the guard and the Westminster Abby ornaments on our first trip to the UK in 2003. I could not have imagined the life change five years later that would have me living here. This one is from a trip to Bali which was the longest flight I’d ever been on until flying to Australia and New Zealand last November. 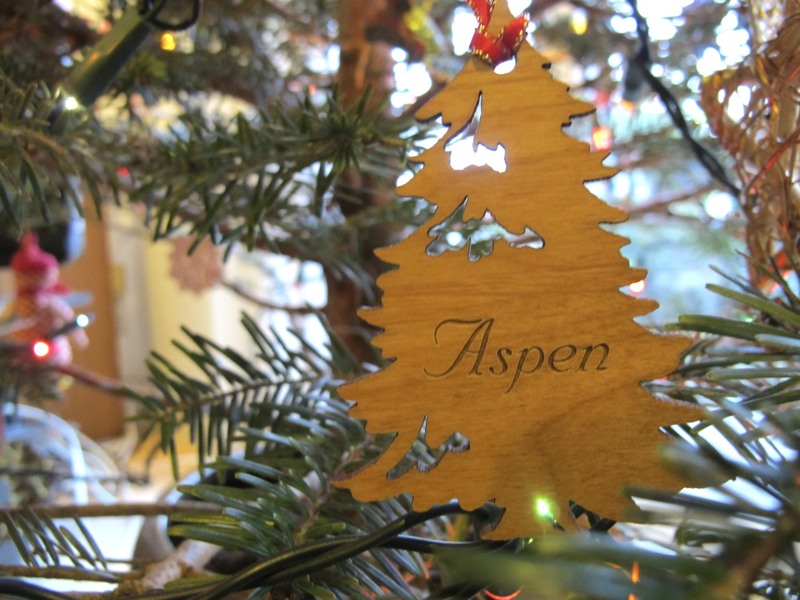 Some ornaments look rather ordinary, but remind me of my resilience such as the one from Aspen, a place where I went snowshoeing only ten days after major surgery. Not the smartest thing I know, but I couldn’t let the opportunity pass without an attempt. 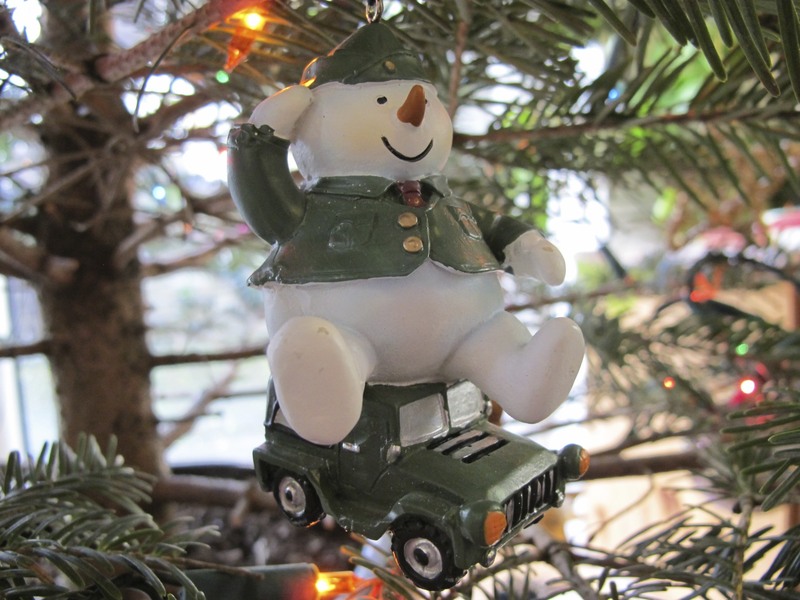 This one reminds me of my military service and my memories of jeep driving in Grafenwoehr, Germany. 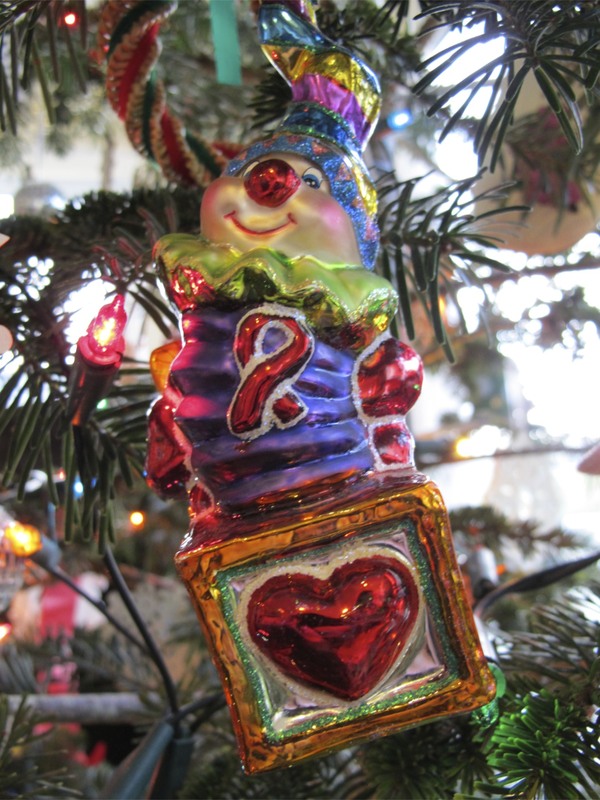 This Christopher Radko ornament reminds me of people living with HIV and the good folks who provide care for them. This one has a story too long to tell in a blog post, but it makes me smile to see it. A bird in a nest for John who has increased both my knowledge and appreciation for birds in ways I would not have imagined. The penguin in the background is was a gift from a sweet woman I met when I first worked in HIV. Annie works in Hospice and is the kind of person you’d like by your bedside at the end of your days. Butterflies always remind me of my dear friend Marty who had a conversation with me before he died while standing next to his butterfly garden that changed my life. 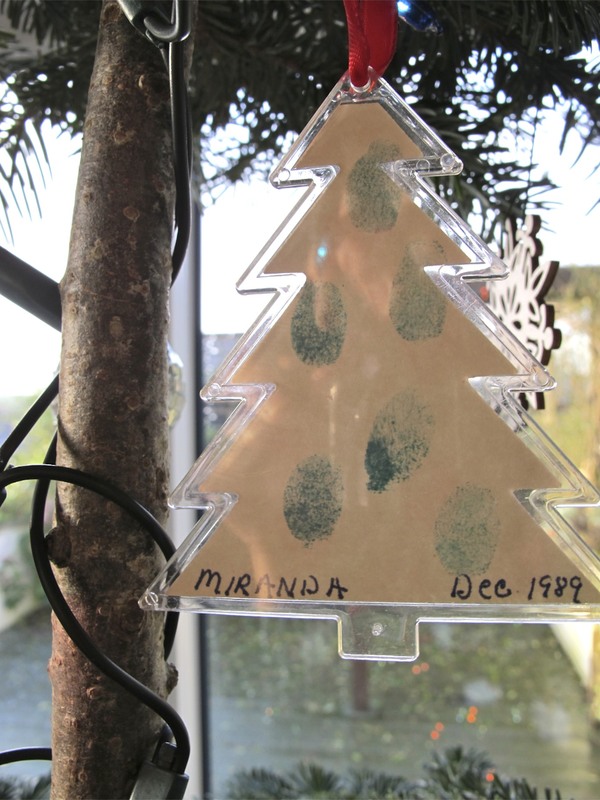 My favorite ornaments are those made by my daughter Miranda as she was growing up. I love the simplicity of the hand colored one above and the sweet one below with her little fingerprints made when she was only two. 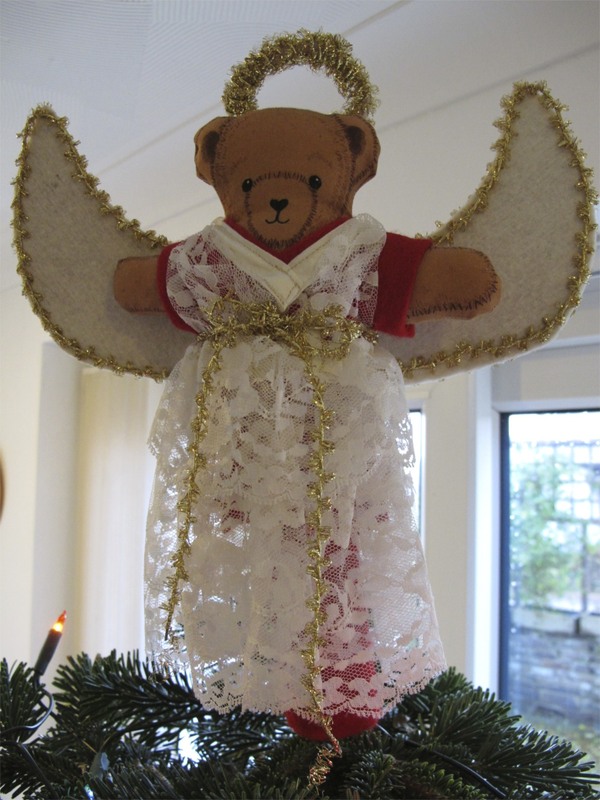 I made the bear angel that sits on top of our tree for Miranda’s first Christmas 24 years ago when she was a few months old. She had a bear theme in her bedroom and I carried it over to the tree that year with bear ornaments and bear garlands. I didn’t plan on it being a forever tree topper, but it’s so connected with her that I love seeing it there every year. The same person who asked if I was decorating for Christmas also asked me if our tree had a theme and I said that was really just a mix of ornaments and not one based on color or anything else with a common element. Thinking about her question later, I think there is a theme to our tree and it’s more than just travel and pretty colors. 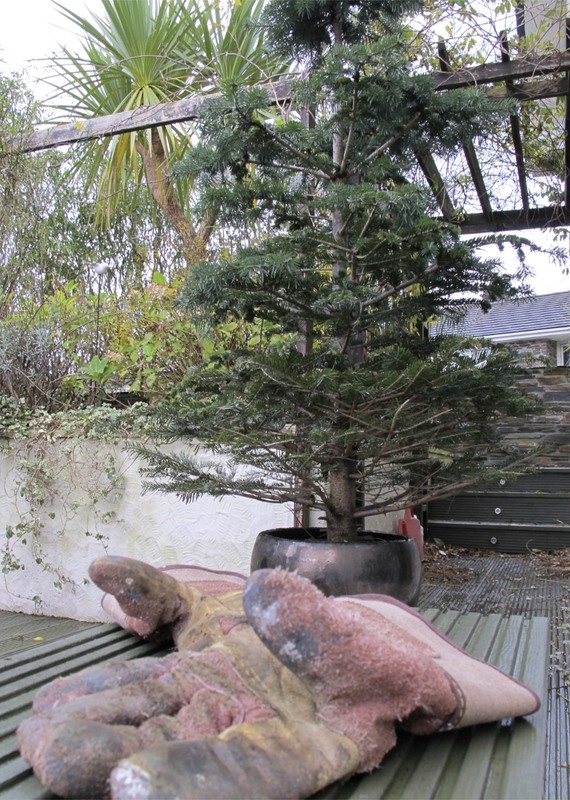 Our tree is a live, slightly lop-sided one that is also recycled in that we keep digging it up. It’s covered with a collection of ornaments that are there because they mean something and it feels to me like a way to have people I love around me at Christmas if only in memory of other moments we shared with together. Here’s what it looked like a few minutes ago. 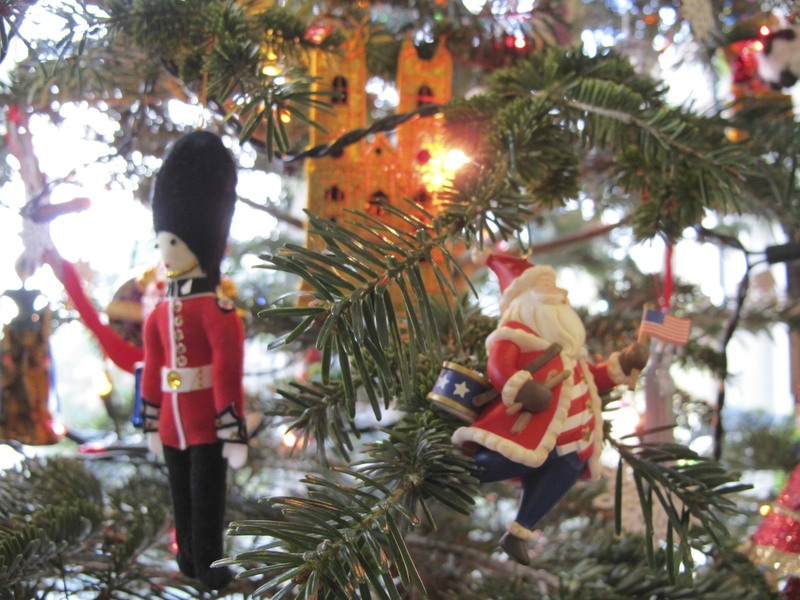 If you’d like to share a link to your tree or any other decorations you have this time of year, feel free to leave a comment and a link below. 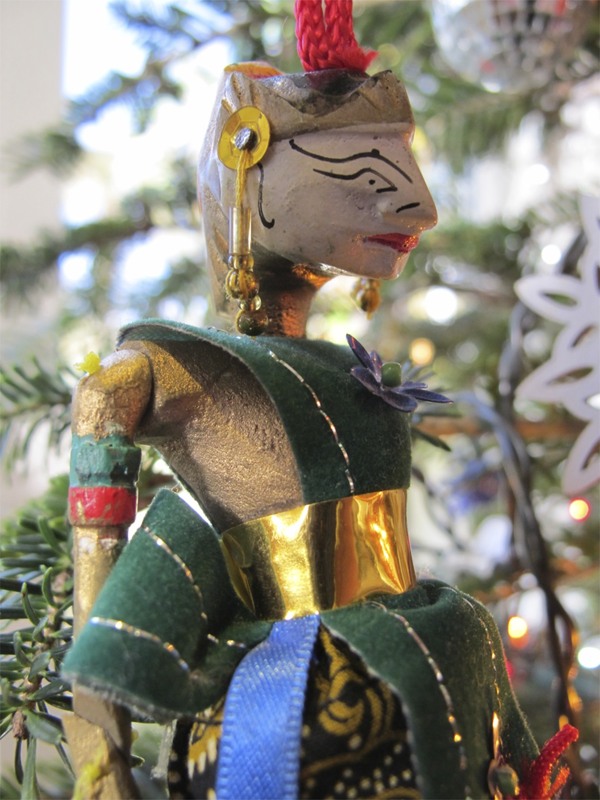 This entry was posted in Choices, Cornwall, DIY, Expat, Family, Life in General, Living in UK, Love, Memories, One Word - Completion, Travel and tagged Bali Puppet, Christchurch, Christmas Decorations, Christopher Radko, Elizabeth Harper, Gifts Of The Journey, John Winchurch, Meaningful Ornaments, New Zealand, Trimming The Tree. Bookmark the permalink. What a delightful post. 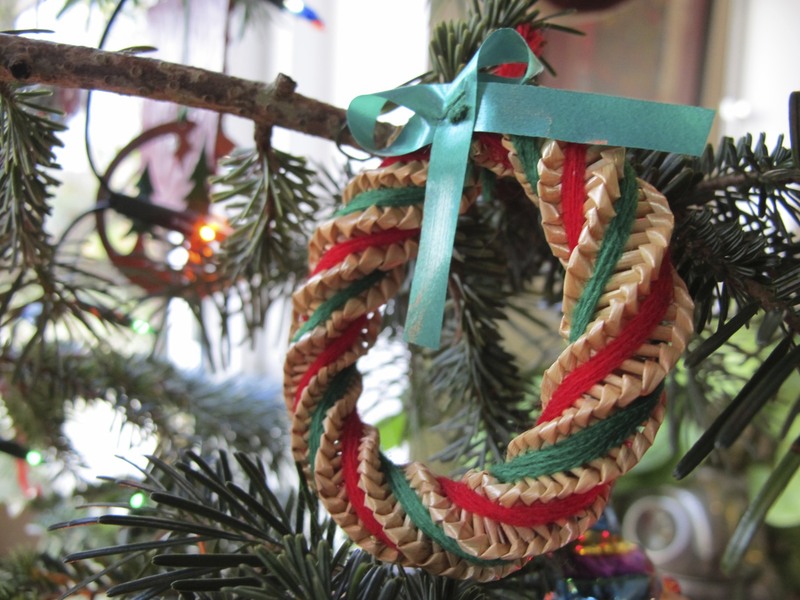 I love your ornaments and their stories and I love the recycled tree in its glory. Enjoyed this so much–thanks. 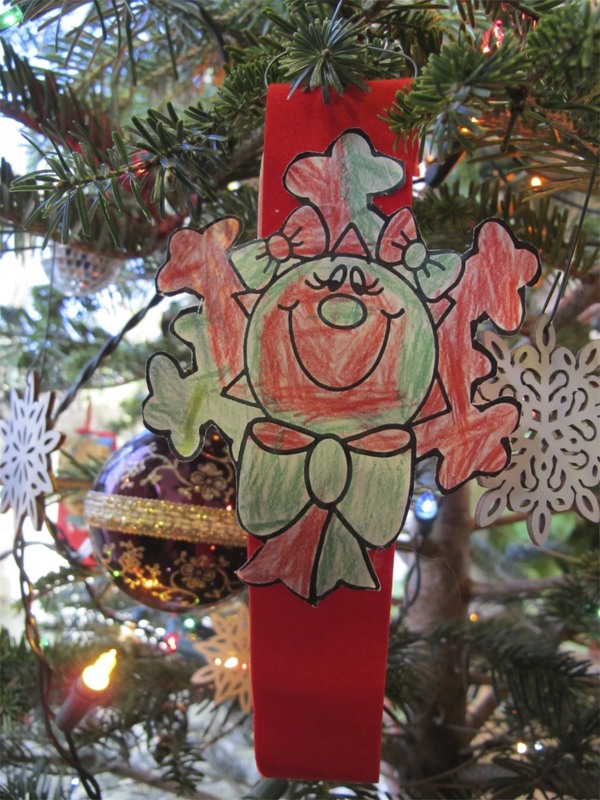 What a lovely idea – it’s a tree packed full of wonderful memories. It puts me to shame that all I worry is about is which colour theme I’m going to use this year and only use ornaments that are cheap and cheerful so they can change every few years to keep us entertained and maintain the wow factor for the kids. Your tree has much more kind-hearted soul. What a delight. 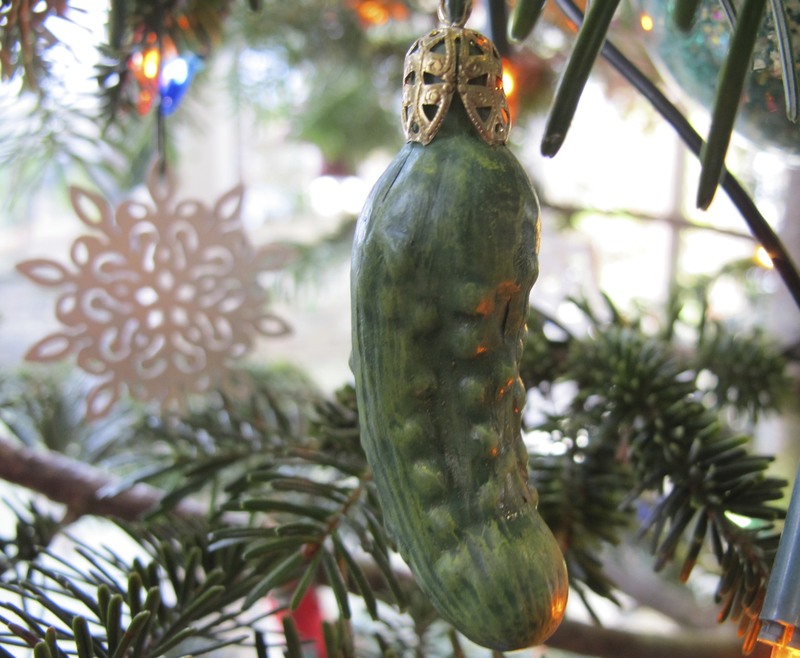 You have the perfect solution to my Christmas tree dilemma. I do not want a fake tree. I do not want a cut tree. The live rental trees are ridiculously expensive and small. When I have a house again and a place to grow a tree, I will grow my own. Perfect! Really enjoyed the decorating of your tree, it obviously holds many memories that mean so much, ones that you can relive every year. 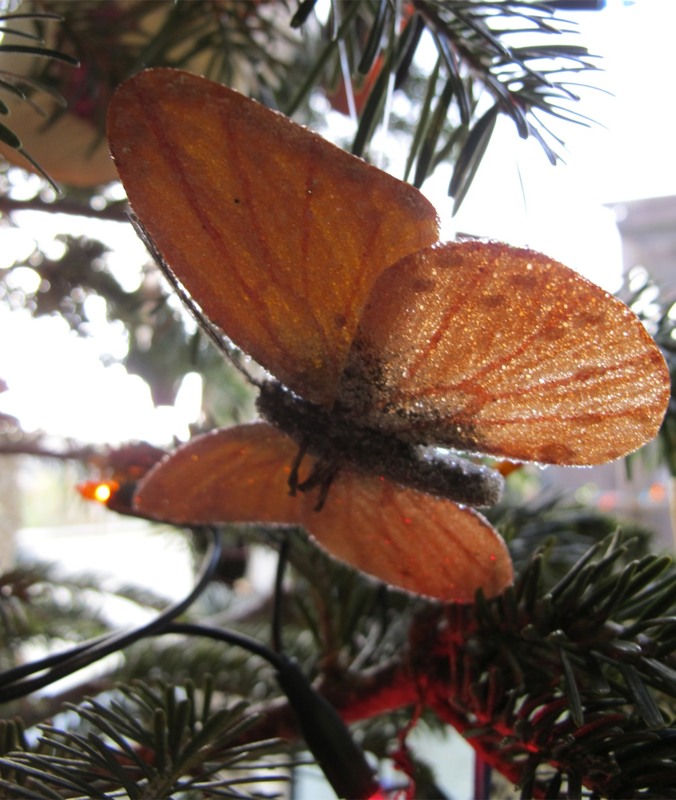 Hope you pick up many more, there will always be room on the growing tree (as long as it fits into your house). 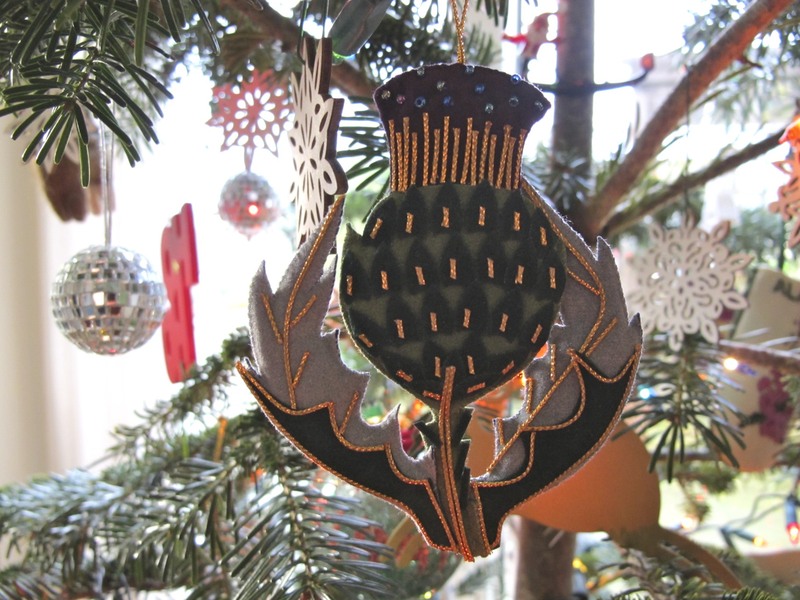 Loved all your ornaments, especially the thistle one. I came across your blog sometime ago and pop in and out to watch your adventures. I just had to say this is the most special, personalised tree I have ever seen. It’s very beautiful! 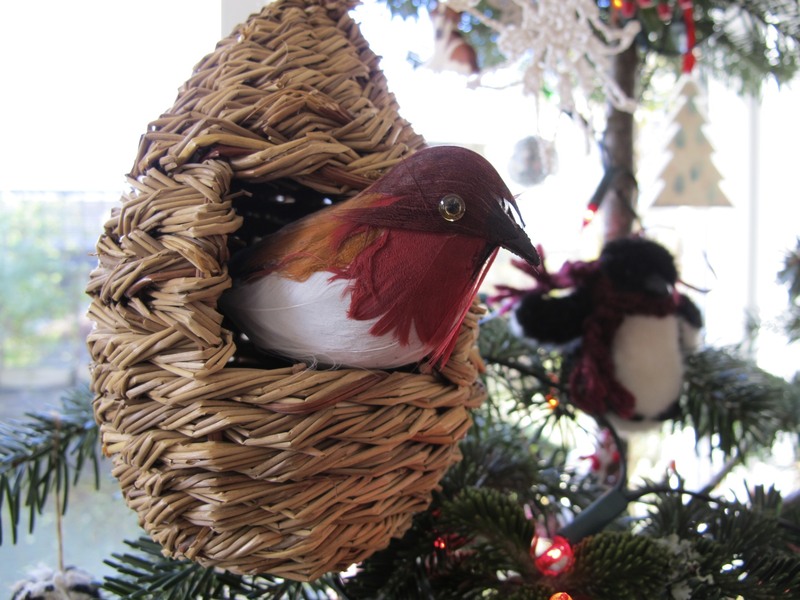 Love this tour through your ornaments and then seeing your living room all cosy and cheery. I too have just a few ornaments compared to what I had in the past, and cherish those that I have. Maybe this is the inspiration I need for my first re-blog post. Merry Christmas! !